Tomorrow, the Event Horizon Telescope project will finally reveal either the image of Sagittarius A *, or the image of a supermassive black hole located in the center of the Milky Way. We may have seen the birth of a black hole or a neutron star ! 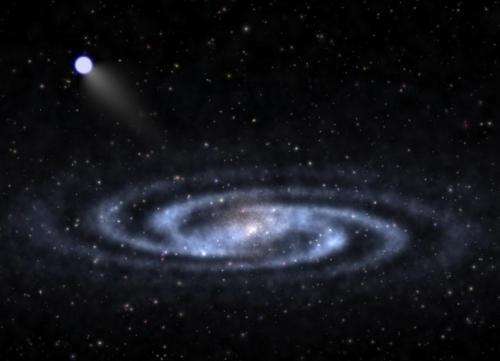 In June 2018, astronomers from around the world witnessed a huge explosion that occurred about 200 million light-years away in the constellation Hercules. A few weeks later, the object had lost much of its luminosity. Since, hypotheses accumulate to try to explain the exact nature of this cosmic event. Is it a particularly powerful supernova, a white dwarf brutally dislocated by a black hole, a magnetar or a gamma-ray burst ? The object has been named AT2018COW. It appeared much brighter than a normal supernova, and above all it lit and calmed down in record time. It only took a few days for it to reach its peak of brightness and another 16 days to lose much of its brightness. An international team in collaboration with the Keck observatory thank about the source of this event. 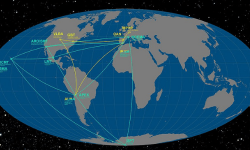 They combined X-ray, visible light, infrared and radio observations from several observatories. They realized that this cataclysmic event propelled matter to almost 10% of the speed of light, and discovered what was hidden in the heart of this explosion. They are almost sure that the explosion observed during the summer of 2018 is the formation of a black hole or a neutron star. This is the first time that such an event can be followed virtually live. 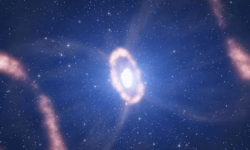 Black holes and neutron stars are formed when a giant star dies. When the thermonuclear fuel is exhausted, the heart of these stars collapses in an instant under the effect of its own gravity. The outer layers of the star are blown into a gigantic explosion and it remains only one object of very high density in the center, a neutron star or in the most extreme cases a black hole. We do not yet know which of these two objects was born at the heart of AT2018COW but it is the ideal opportunity to dive into the complex physics that accompany their birth. When you observe a neutron star, it is generally already a few hundred years old, if you are lucky. The observations of AT2018COW were facilitated by several things. First, the explosion expelled much less material than when a typical massive star died. With ten times less debris in front of their telescopes, astronomers could directly observe the radiation of the central object. On the other hand, 200 million light-years is a small distance on the cosmic scale. Other similar objects could therefore will be discovered. The observation of AT2018COW is a striking example of the growing importance of speed in astronomy. Many of the most interesting events in the universe are ephemeral. In order to be able to observe them in the best conditions, observatories must be mobilized very quickly before these events can be completed. For example, this is important to be quick to be able to identify optical signals with gravitational wave detections. This is a new area of ​​progress for observatories around the world that does not involve better instruments but better organization and collaboration. This is the necessary condition for being able to dive into the heart of the most violent events in the universe. Stephen Hawking predicted that black holes can evaporate and disappear. At the edge of their event horizon, radiation should form the Hawking radiation. This radiation cannibalize the mass of a black hole until its complete evaporation. However, it is an extremely weak radiation. The evaporation process would therefore be very long for most black holes. It would actually start when the universe itself will be very old and cold. Black holes could then emit more radiation than they absorb and begin to lose mass. For a black hole of the mass of the sun, it would take around 1064 years for total evaporation. The most massive black holes in the universe may require up to 10106 years to evaporate. These are so huge numbers that it’s almost impossible to imagine. If Stephen Hawking is right, long after all the stars and all the galaxies are gone, the universe will be dominated by black holes slowly evaporating. They will also eventually disappear, leaving a great void traveled by a few particles.